Join early-- Don't miss out on even one issue! The years most current mailed issue of the newsletter will be sent upon joining. Online subscribers will receive an invitation to gain access to the online edition. From the Ground Up is published four times a year. All Members can have access to our interactive members-only website. All content (unless otherwise noted) of the quarterly Natural Fibers Group newsletter, From the Ground Up, is copyrighted and may not be reproduced, reprinted or published in any form without first obtaining permission from individual authors and the Natural Fibers Group. The information in the newsletter is intended for personal private use only. It is not intended for redistribution in other newsletters, publications, hand-outs, classes, or websites, unless specific permission is given. Meetings are generally held once a month on the first Monday alternating with first Thursday, in Washington, NC, 6:00pm. Our Monday location is the Blind Center, 3rd and Harvey Sts., Washington, NC. Our Thursday location is the Beaufort County Arts Council, 2nd and Gladden Sts., Washington, NC. Current meeting information can be found on the home page of this website. New members who want to attend, please email or call to confirm date and time. Sometimes we cancel a regular meeting because of a closely scheduled plant gathering expedition or other basketry event. We are quite willing to change a meeting date (if possible) to accomodate members from around the country who are visiting or passing through and who would like to attend. Just contact Lynn , and we will try and work something out. Newsletters should contain information useful enough that readers will want to keep them for reference. 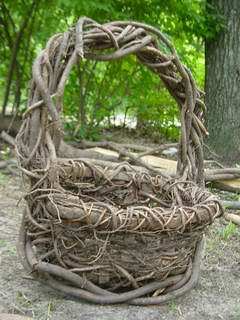 The Natural Fibers Group newsletter, "From the Ground Up", contains tutorials, tips, and discoveries about natural materials and their use in basketry and art. It not only chronicles the activities of the group, and individual member experiences, but shares the how-tos of the fibers we are working with. I'm committed to the idea of making our newsletter instructive as well as newsy. From the Ground Up is published four times a year. January begins the new membership period. We are always looking for interesting tutorials and educational articles related to naturals. You don't have to be a member to submit an article. We will include a short bio or a small ad, if desired, directly following your article. If your article is accepted and you aren't a member, we will also send you a copy of the newsletter it appears in. Please email first, and lets discuss what you have in mind. Members, we want your input too! You are the backbone of the newsletter, so please send us your news, opinions, articles, tips, tutorials, class reviews or anything related that you'd be willing to share with the rest of your NFG Guild. I really love hearing from you! *Charmayne Cesal's discovery in a mother's day arrangement! * NFG Happenings- The Great Vine Gathering, random weaves, gourd outing, exhibits..